He's totally smiling too. Can't you picture him sliding off the couch in slo-mo? Submitted by alert reader Emma. Hello, My name is Jessica and I'm a Cute Overload addict. How is a girl supposed to get any work done when there is so much cuteness to be seen? Cuteoverload folks, you are making the world a better place, one picture at a time. Cheers! OMG. I squealed so loud one of my cats came running. THE CUTE! Hahaha - unreal funny pic! There's some action going on in that mid-section crotch-al area. Looks like a winky is up. I believe it's a corgi. Is that a Shiba Inu pup? It's not a Shiba - the ears are too big vs. the head and the nose is a bit long for that level of fluffiness. The urajiro is quite good, though... I put my bets on a Corgi or similar. Is that a basenji?? It looks a bit fuzzy, but I know basenjis can be highly flexible and sleep in impossible positions. reminds me of how snoopy use to sleep on top of his doghouse. He's just too cute for words!!! hee hee u can see his lil ding dong!! It's a corgi, and it was taken from the somethingawful.com pet forum. It isn't photoshopped. This little guy looks like he's preparing for the doggie luge event at the winter olympics. How cute can ya get? It is most definitely a Pembroke Welsh Corgi. I have one myself, and he used to sleep that way too. I found myself wanting to put a mirror under his muzzle to make sure he was still breathing. 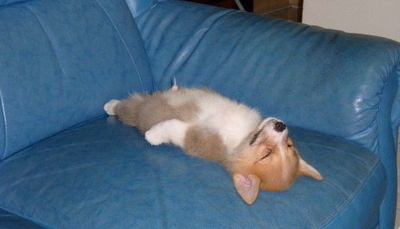 I love Corgis and have never seen another dog sleep that way. Very cute picture! Every dog has it's charm, and this one is definitely no exception. Just keep on posting folks, it makes this interenet world a better place!! This is one of the cutest things I have ever seen, and to be honest, I'm rather cute, so that's impressive! :) The bad news is I saw it at work and laughed so loud my supervisor heard me and I got in trouble. Still worth it though! WOW i love this blog this has got to be the best cutest blog ever! thanks for making me smile ear to ear for the night :) adorible! What is he dreaming of? - if he was my dog he would be dreaming of being chased by a huuuuuuge chicken dinner, dripping in gravy, closely folllowed by roast potatoes, yorkshire puddings and a big gravy boat! definately a corgi pup, cute, cute, squeak, cute! It makes me think that a midget is in a dog suit and is having a nap. Lol. that is just wayyy too cute. my schnauzer used to sleep like that when she was a a tiny little puppy... but stopped once she got older. this makes me miss her babyhood. This is CGI fo sho! Jus' kidding, the wife and I think it is AWESOME.